Ambari is an Apache project focused on making Hadoop management simple by developing software for provisioning, managing and monitoring Hadoop clusters. It provides both an easy GUI based interface as well as APIs to provide this functionality. You can read more on Apache Ambari here. Ambari Views allow developers to create UI components that can plug into the Ambari Interface using the Ambari Views Framework. Ambari already ships with a few predefined sets of Views customers can use with their cluster. Two of these are Hive and Pig views. We are proud to announce Ambari Views on HDInsight. Ambari Views today work only on HDInsight Linux clusters. To use this capability in HDInsight, click here to learn more about deploying Linux clusters using HDInsight. 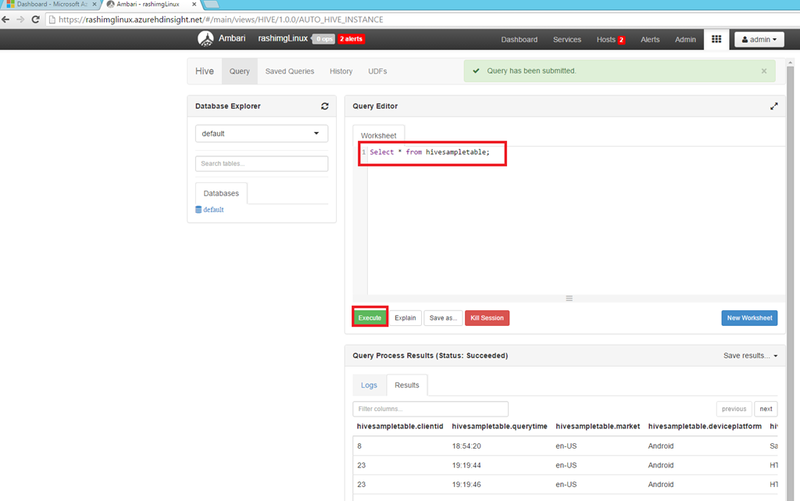 You can use Ambari Hive View to browse databases, write an execute Hive queries, look at your job history, set Hive query execution parameters and also debug Hive queries. Ambari views can be launched from the Ambari portal and can be used to submit Hive and Pig jobs. For more details, please read our extensive tutorial on using Hive Views here. Check out how easy it is to submit a job using Ambari views below. 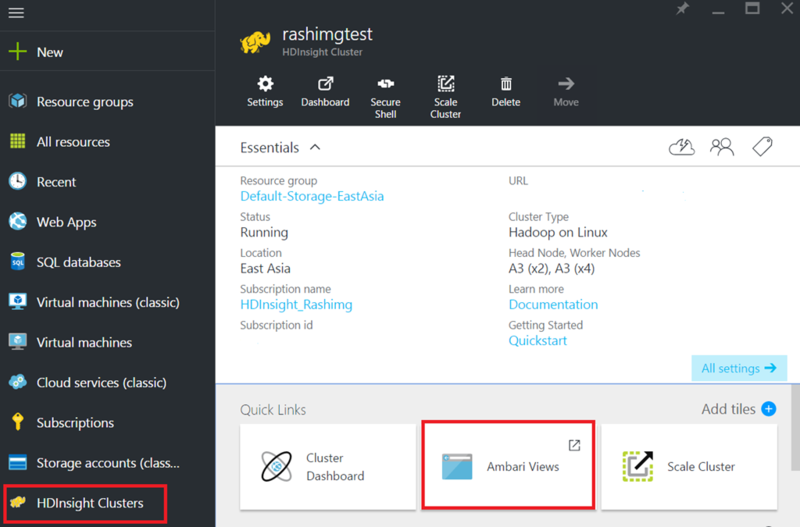 To make it easy for you to find Ambari Hive views we have added a link to open Ambari views from the cluster dashboard page as shown in the picture below. Clicking on it will directly take you to the Ambari Hive view page. We will add details on each of these in the future as part of HDInsight documentation. Please let us know if you have any feedback on how we can make HDInsight easier for you to use in the comments below.